It is hardly possible with only words to describe the dignity and might of the Russian capital Moscow. This city is the embodiment of all the potential and the strong national spirit of Russia. Moscow is situated on both banks of the River Volga. Besides it, through town run a few dozen of its tributaries. The largest tributary is the river Yauza, and most of the small tubes are closed in the streets. The city is in the center of European part of Russia between the Volga and Oka rivers. With a population of more than 10.5 million inhabitants, Moscow is considered the most densely populated city in Europe. For the first time the name of Moscow is mentioned in 1147 when, according to the chronicles there meet princes Yuri Dolgoruki and Sviatoslav Olgovich. That year is provisionally accepted as the year of founding of the city. In those medieval times, Moscow is a small village in a remote area with a majority of Finno-Ugric population. In 1156, Prince Yuri built wooden walls and a moat around the city. After the sacking of 1237-1238, when the Mongols burned the city to the ground and killed its inhabitants, Moscow recovered and became the capital of an independent principality. There is a huge cultural and architectural potential in the Russian capital Moscow . The city is dotted with dramatic theaters, which are constantly being filled with various opera and ballet performances. The indisputable leader in this respect is the notorious Bolshoi Theatre. In Soviet times the ticket prices were worth a few dollars, but major changes have undergone since then. Bolshoi Theatre is located in Moscow and is one of the most important theatres in the world of opera and ballet. The official date of laying the foundation is in March 1776 when the governor of Moscow Prince PW Urusov receives permission from the Empress Catherine II for theatrical performances. Prince began construction of the theatre called "Petrovski" on this address on the street "Petrovka". But the building burned before the opening of the theatre and the prince assigned the job to the English building contractor Michael Medoks that builds it. "Bolshoi Petrovsky Theatre" was the name then. This structure lives 25 years before being burned. In Moscow is the Russian State Library, the largest in the country. Its archives comprise more than 42 million units, including 17 million books. The Russian State library has its origins in 1862 based in the Rumyantsevska library, the first free public library in Moscow . In 1921, it separated from Rumyantsevskiya Museum and was renamed the State Library, and today employs more than 2, 100 people. Calling card of the Moscow is the Kremlin. 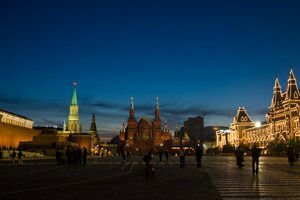 It is certainly emblematic of Moscow Red Square. The Kremlin is the common name of the vast complex of impressive buildings in downtown Moscow. On its territory there are several important structures of government: presidential, governmental and other bodies. Moscow’s Kremlin has a shape reminiscent of a triangle. 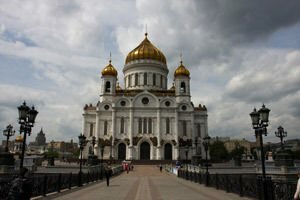 In 14th century the Russian Orthodox Church has its headquarters here, and one or two centuries later, there are two large cathedrals. Undoubtedly the most remarkable is the church "Annunciation". Most of its visitors come here to see the most beautiful iconostasis, which can be seen in Russia. Interior of the Kremlin is fascinating for its beautiful religious paintings, especially with several incredible, masterly painted icons. The church "Assumption" boasts that it has the largest bell in the territory of the Kremlin. The third church is distinguished by its two golden domes and named "Ivan the Great". 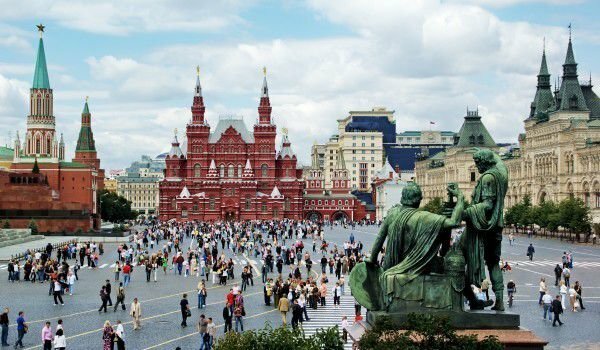 The Red Square in Moscow is an impressive 700 meters, and undoubtedly the biggest attraction here is the Temple, "Wasilewski fair", with its unique colorful domes. The Moscow metro, is also unique. It is intended as a celebration of socialism, and today the beauty of it is fully restored with its magnificent decorations. The first metro line in Moscow was opened in 1935, but plans to build it were there before the Russian Revolution. Today the Moscow metro is a unique combination of museum and art gallery, about 8, 1 million passengers a day pass through it.